Are you in need of routine maintenance or major service repair for your vehicle in Indianapolis? 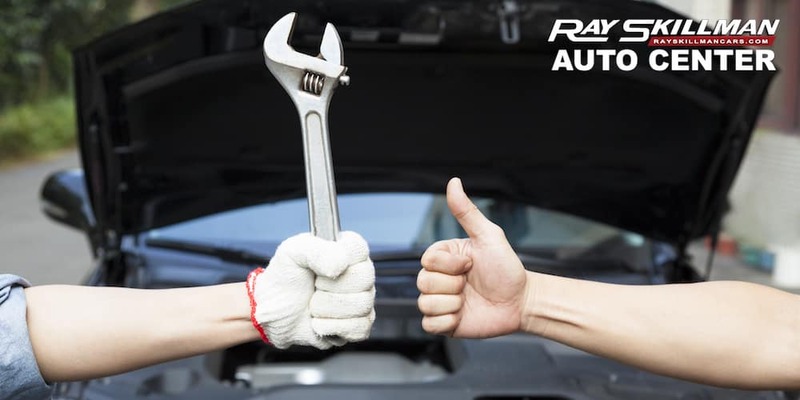 Let the Ray Skillman Auto Center crew take care of it for you today. Whether you are in need of routine maintenance, a major repair, or something in between, Ray Skillman Auto Center is your one-stop shop for every service need. We have a staff of certified technicians trained by the manufacturer to ensure your vehicle is repaired and maintained according to their guidelines. Make your appointment online or by phone to get started. We take the care of your vehicle very seriously. Your vehicle is a huge investment and it deserves to be taken care of by a team of experts. You wouldn’t let just anyone replace the electrical wiring in your home, would you? Then why would you trust your vehicle maintenance or repairs to just anyone? It doesn’t make sense, does it? Ray Skillman Auto Center employs a team of experts that are ready to maintain and repair your vehicle. All of our Service Technicians are trained and certified by the manufacturer and must go through a rigorous course prior to certification. They must all put in a certain amount of hours before they can be certified. Each technician undergoes refresher training to keep up with new technology so they can continue to work on new vehicles. Our people are experts and are capable of handling all of your routine maintenance or a major repair. Let our experts take care of your vehicle at Ray Skillman Auto Center today. Who has time to go to Jiffy Lube for an oil change and then to the transmission shop for an inspection? If you are like most of our busy customers, you want to get everything done at once. We are a full-service maintenance and repair shop so we can handle all of your needs in one appointment. Did you know that we could also do quick inspections to see if there is an issue? We can also do DEQ checks and inspections to save you some time. These items are not a comprehensive list; we can handle all of your maintenance, repair, and collision needs. Talk to one of our Service Advisors to schedule your appointment at Ray Skillman Auto Center. Many people don’t consider how important it can be to have their vehicles serviced at their dealership. Many stores will give you free maintenance like oil changes with the purchase of your vehicle so you can save money. When we see your vehicle routinely, we can look for potential items that may become an issue down the road and eliminate costly repairs. For instance, if we notice that your radiator is using too much fluid, we can seal or replace it before it causes head gasket or engine issues. We service your vehicle according to the manufacturer’s guidelines to ensure that your vehicle is running optimally to help you avoid problems down the road. Many people think that they can save money by using a quick lube store, but in reality, it is usually more cost effective to have it done at your dealership. We even offer service coupons to save you more. We really are experts and can help to make sure that your vehicle will last longer. Come see us at Ray Skillman Auto Center today.